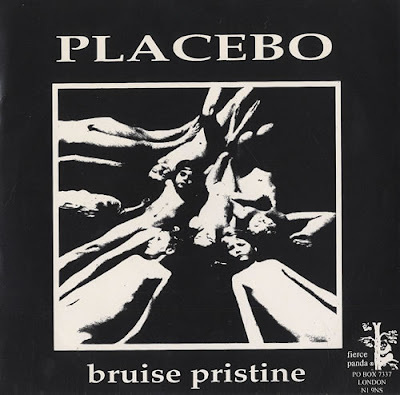 Placebo Anyway Blog : BRUISE PRISTINE - Placebo's first single was released on 2ND FEBRUARY 1995. The first ever release from PLACEBO on Fierce Panda Records. This 7" single is very rare and is a split single with the band SOUP. Soup - MeltdownFORMAT:7" vinyl The UK 45-rpm 7" single - a classic format if ever there was one. Since its creation in the early 1950s it has lent itself to all manner of musical tastes and styles. Far more durable than the 78-rpm shellac discs it replaced, and with greatly enhanced sound quality, it has become an iconic format of popular music culture. Each decade has seen an evolution in the way the humble black plastic 7" disc has been used; from the 50s and 60s issues with their jukebox/multi-stack friendly push-out centres, to the 70s solid-centre creations and the gradual introduction in the UK of eye-catching picture covers, to the 80s excess of coloured vinyls and limited edition packaging in all its glory. Their gradual slide in popularity during the late 90s has now taken an upward turn in the 2000s, with hip Indie artists choosing to return to this classic format and many labels again issuing exclusive limited editions aimed specifically at collectors. en 1/31/2016 01:21:00 p. m.